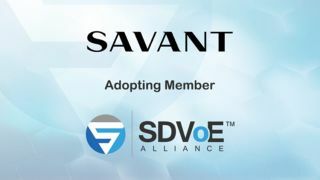 The SDVoE Alliance has announced that Savant, a provider of smart home technology, has joined the alliance as an adopting member and will demonstrate their new SDVoE-based IP Video product line at ISE 2018 (Amsterdam, Feb. 6-9, stand 5-U120). The new switching platform delivers 4K/60 4:4:4 HDR video distribution over IP with zero-frame latency, leveraging Savant’s history in telecom to deliver advanced high-speed scalable IP entertainment. The companies added: "Integration professionals will appreciate the convenience of a centralized 10GbE switch, enabling high-bandwidth Ethernet connectivity throughout the project. The video and audio distribution capability of this new switch cost effectively meets the demand for the highest quality experience across any job size, with scalability only limited by the size of the network, allowing installations of from 2 to 128 zones or more. New products in the lineup include the Savant IP Video 4 and 8 input video transmitters as well as Savant IP Video output receivers available with either fiber or copper as an option. Versions of the Savant product include on-board DSP processing to manage conversion of Dolby and DTS formats to stereo down-mixes, enabling a full range of residential applications – from sophisticated home theaters to simple kitchen TVs – to be supported on a single integrated hardware/software platform.